empty calories – what are they? Despite what the term implies, most empty calorie foods can contain an extremely high number of calories. Often known as discretionary calories, they produce the same amount of energy as other calories but have little, or no nutrient value whatsoever, hence the term “empty calories”. There are many empty calorie foods but the biggest culprit, especially if trying to lose weight, are sodas, carbonated soft drinks and fruit drinks. These all contain high amounts of sugar and sweeteners. 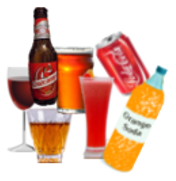 Alcohol contains no nutrients whatsoever apart from empty calories. 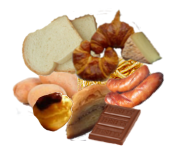 These are closely followed by empty calorie foods such as cakes, pastries, pies etc, although not as high as sodas and soft drinks, they can contain large amounts of sugar as well as saturated fats such as butter, margarine and lard, plus the worst fats of all: trans or hydrogenated fats. Many of them also contain processed carbohydrates. Other foods to avoid are fast and junk foods. Most of them contain unhealthy trans and hydrogenated fats, especially the likes of French fries, breaded chicken, onion rings and fish fillets, which are deep fried mostly in hydrogenated oil. Not conducive to low cholesterol and a healthy heart! Did you know that 1 teaspoon of sugar, depending on the size of the spoon, can contain between 15 and 20 calories? Did you also know that a 12 oz. (355 ml, 3/5ths of a pint) of most fruit drinks contain 12 teaspoons of sugar? That’s a whopping 180 calories of sugar without anything else. Sodas and soft drinks, particularly carbonated ones, run a close second with 9 teaspoons of sugar per 12 oz. serving. Candy and candy bars all come into the equation with a 1 oz. (28 grams) chocolate bar having 3 teaspoons of sugar. It is really important you don’t over-indulge on empty calorie foods, especially if on a weight loss diet as, apart from lacking in vitamins and minerals and many other nutrients essential to good health, over-indulgence will lead to weight gain. It is also important that a proper body weight be maintained. This can be done by balancing food energy intake with activity. If you engage in heavy physical activity you will need more food energy as fuel than a person who leads a sedentary life or does little or no exercise (not advisable), this can be supplied by empty calories foods in addition to balancing them with foods with essential nutrients. Male aged 19-30: 2400 (330); 31-50: 2200 (265); 51+ 2000 (260). Female aged 19-30: 2000 (260); 31-50: 1800 (160); 51+ 1600 (-). Calories from alcohol are not from solid fats or added sugars, but they count against your limit for empty calories. I hope this article has given you some insight as to why empty calorie foods should be avoided in any healthy diet, be it weight loss or otherwise. Next up, let’s take a look at the pros and cons of organic and non-organic food.